New Delhi: A tennis match between German veteran Tommy Haas and Czech Jiri Vesely was rudely interrupted after a giant iguana ran onto the court. The score was tied 3-3 in the third set when the iguana climbed on top of a scoreboard - perhaps to take a closer look. Officials tried to shoo it away but the terrified lizard leapt onto the court instead and scurried across it. Miami Open fans watching were cheering all the way and flooded social media with pictures and videos of the hilarious incident. Officials first tried to shoo the iguana away with a towel but it refused to budge. 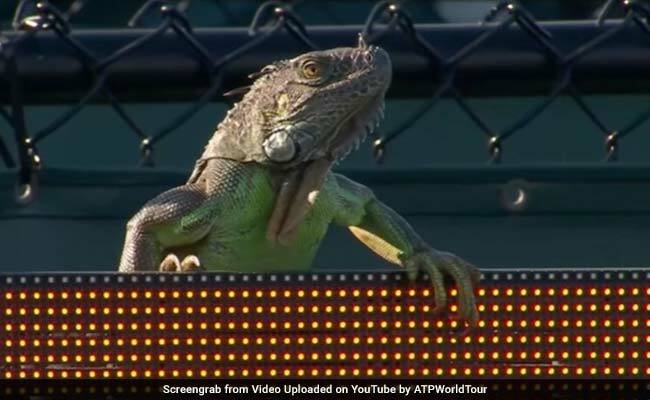 When the chair umpire told the tennis players that they would resume play with the iguana sitting on the scoreboard, Vesely refused. "I can't concentrate," Vesely was caught on camera telling the umpire. He was supposed to return Haas' serve from the iguana's side of the court. Meanwhile Haas found the interruption to be hilarious and whipped out his mobile phone to take a quick selfie. Talking to reporters later, Haas said "Maybe the iguana got the note that this is most likely the last time I'm playing here, and he wanted to say 'Hi'...It was nice for him to stop by. Good-looking iguana." Officials eventually carried the iguana away from the court, wrapped in a towel. It only took eight minutes. Iggy the iguana definitely got more than his 15 minutes of fame.